In the month of June last year, after enrolling children from construction sites to PMC and PCMC schools, Door Step School was exploring various options to ensure that children are able to reach school safe and well. Several corporates and private schools with school bus facility, were approached for support. Among private schools, Vidya Valley was first to generously support by offering their school buses. 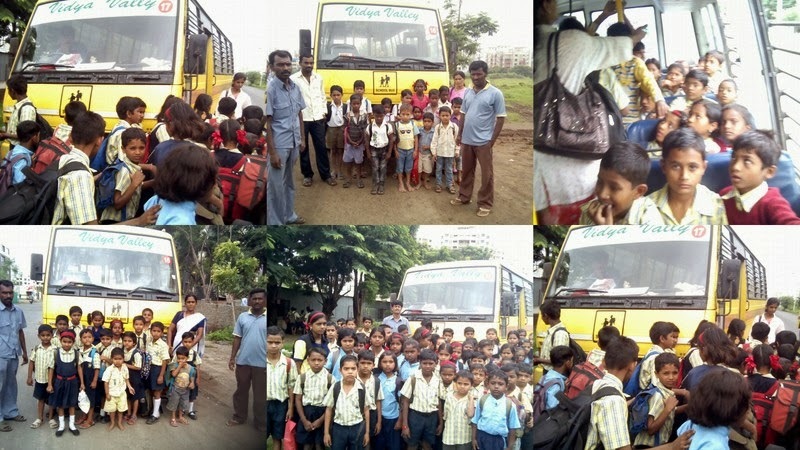 158 children have utilized the Buses so far at 3 Municipal schools in Bavdhan, Pashan, and Balewadi areas. Starting with 25 children in June, Vidya Valley buses currently help transport 125 children to 2 Municipal schools, one in Pashan and one in Balewadi, running in 2 shifts. The children, their parents, teachers, bus escorts, and DSS staff thank Vidya Valley management and the bus drivers and kakas for their excellent co-operation!! The bus drivers and kakas have been extremely supportive, many times stepping down from the bus, helping children cross roads and keeping the children's safety prime at all times. Special thanks to Chaudhury Kaka who has been just a phone call away and available to address the changing needs towards efforts to utilize the buses to their capacity and support more children. Door Step School would like to take this occasion to express heartfelt thanks to Vidya Valley for supporting school transport for the children over last 8 months. Hoping that this can be highlighted as a nice example and more schools can come forward to support in a similar manner in other areas of the city, in the coming year.